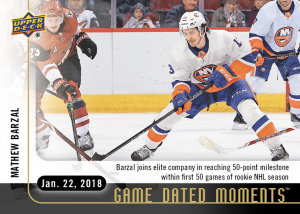 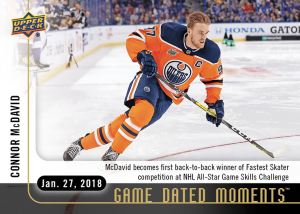 New 2017-18 Game Dated Moments Packs for Week 17 are Now Available on e-Pack! 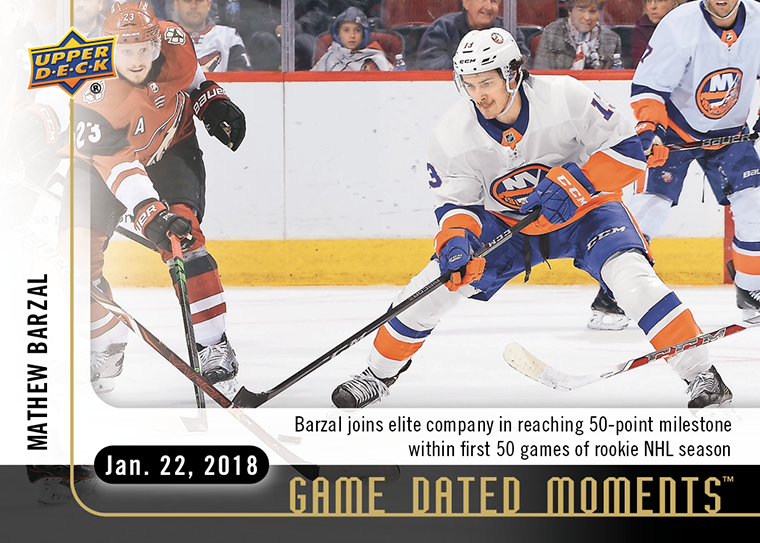 The Islanders rookie maintains his “red-hot” rookie season with an impressive milestone, becoming just the 4th rookie in the past 20 years to score 50 points in under 50 games, joining the likes of elite superstars Ovechkin, Crosby & Malkin. 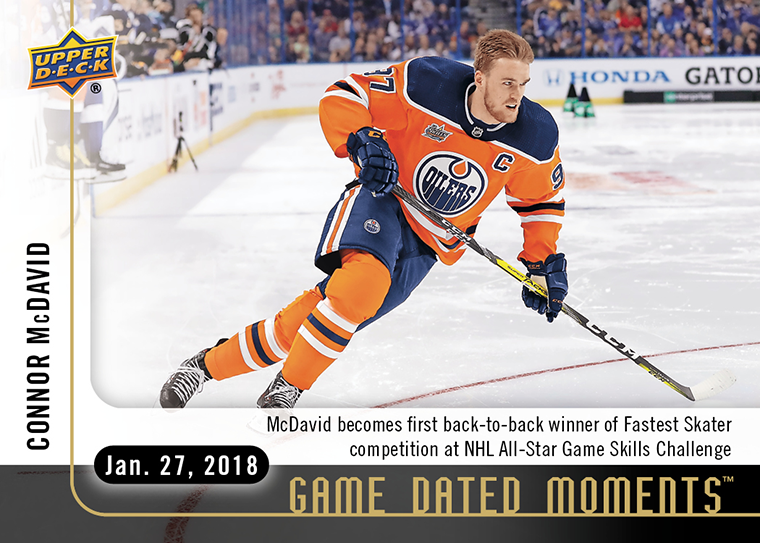 Poised to retain his title, Connor McDavid laces up his skates and loops around the Amelie Arena speeding past the markers and clocking in a dominant 13.454 second run, as he is named the NHL’s® Fastest Skater for the 2nd year in a row. 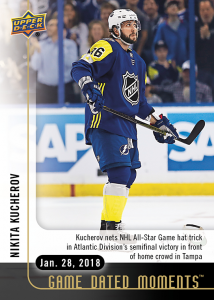 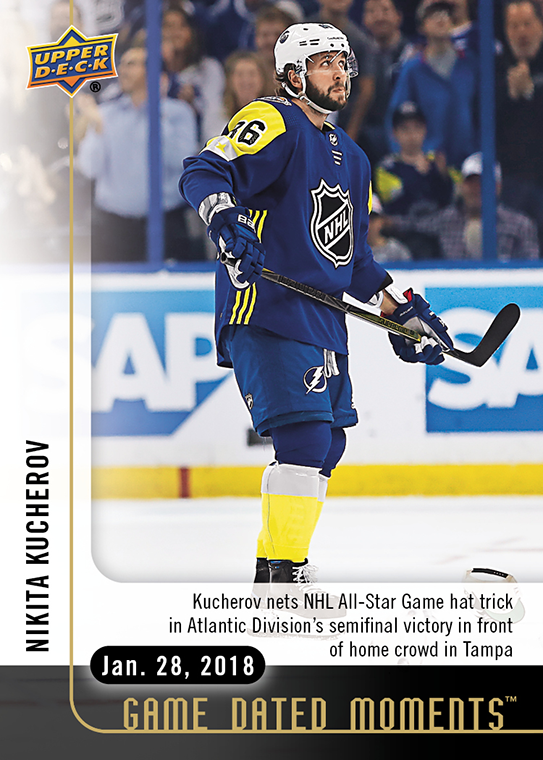 The sun wasn’t the hottest thing in Tampa for this year’s All-Star Game, that honor went to the hometown favorite, Nikita Kucherov, who scored the first ever hat trick since the new 3-on-3 NHL® All-Star Game format change. 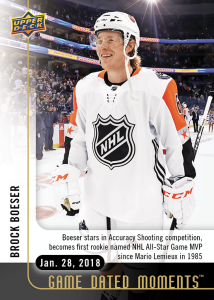 The Vancouver rookie phenom had a huge All-Star weekend, winning not only the Accuracy Shooting competition, but also scoring the game-winning goal for the Pacific Division as they beat the Atlantic Division 5-2. His effort was rewarded as he became the first rookie since Hall of Famer Mario Lemieux to be named the All-Star Game MVP.